Are you a serious writer who wants to take the next step into writing? The CCAC is pleased to offer a grant for one to attend the 14th Annual Gold Rush Writers Conference on May 3 to 5 in Mokelumne Hill. We’re looking for a writer who is committed to the art and craft of writing. 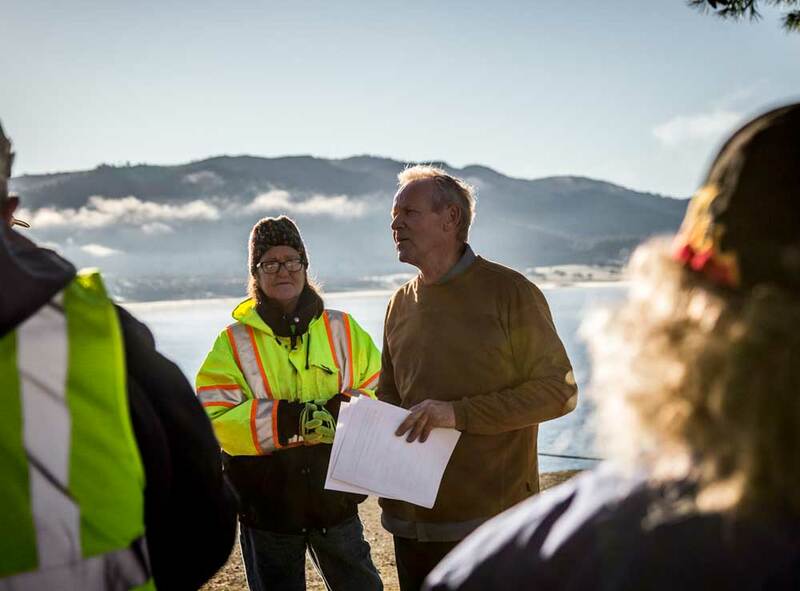 The Gold Rush Writers Conference is an intimate weekend in Mokelumne Hill led by professionals who guide you through a series of panels, specialty talks, workshops and celebrated author lectures. Go one-on-one with successful poets, novelists, biographers, memoirists, screenwriters, playwrights and short story writers. The conference also includes a picnic supper in a Victorian garden Friday evening followed by an open-mic reading, Saturday dinner and Sunday lunch at the historic Hotel Leger. 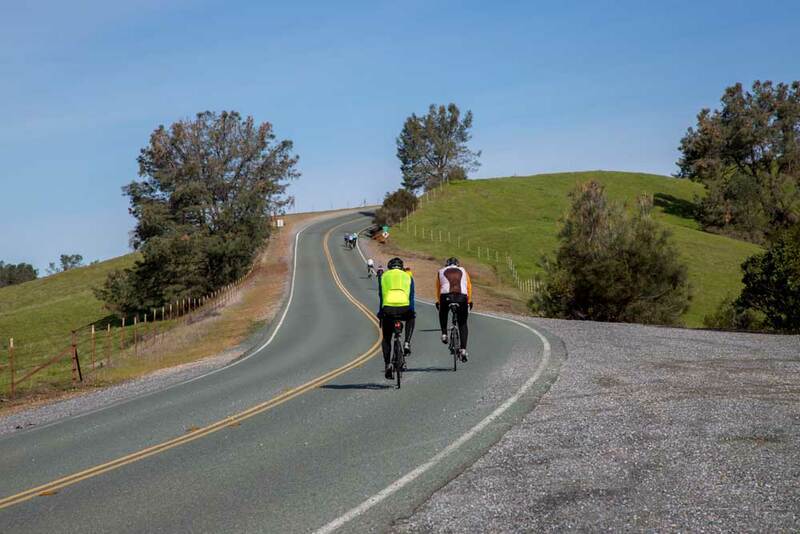 Grant application is open to all Calaveras County residents of any age. Submissions are by email only. Please include all requirements in one document that is attached to your email. 1. A 100-200 word bio about you and your experience and goals for your writing (it’s not necessary to be a published writer, but we’d like to see intent). Do NOT go over the 200 word limit. 2. A short cover letter detailing why you’re applying for the grant, including your need and interest. 3. A 250-500 word essay answering the question, “Why the arts are necessary.” The essay may be a personal essay about why the arts have been necessary in your life, or it may be a researched creative non-fiction piece, or it may be poetry or fiction. Do NOT go over the 500 word limit. Include your name, address, email, and phone number. The Calaveras County Arts Council is delighted to launch our first year supporting Poetry Out Loud. POL is a national arts education program that encourages high school students to learn about great poetry through memorization and performance. The students start by reciting their poems in their classrooms, then move on to a school competition then a county wide competition. The winners of the county-wide competition go to Sacramento to compete against other kids from around California; the winner from the state competition gets an all-expenses paid trip to Washington, D.C. to compete at a national level. The prizes at the national level are big: $20,000 for the national champion and $10,000 for second place. But even at the local level, there will be awards for the winners. Organized by Ingrid Hjelmervik, the Calaveras Poetry Out Loud program has already administered it’s first competition on Wednesday, November 28 at Bret Harte High School. Fifteen contestants recited two poems each to a packed house of fellow students who listened intently, clapped and cheered, and encouraged the contestants. The competitors were terrific, with sensitive and entertaining readings of poems like Vachel Lindsay’s Abraham Lincoln Walks at Midnight recited by Daniel Abando and Edgar Allen Poe’s The Conqueror Worm dramatically presented by Kayla Auten. The countywide competition will be January 30 at the Calaveras High School Performing Arts Center. Poetry Out Loud is an initiative of the National Endowment of the Arts and the Poetry Foundation. In California it is administered in the state by the California Arts Council. The Calaveras County Arts Council is proud to be the county administration for this exciting program. 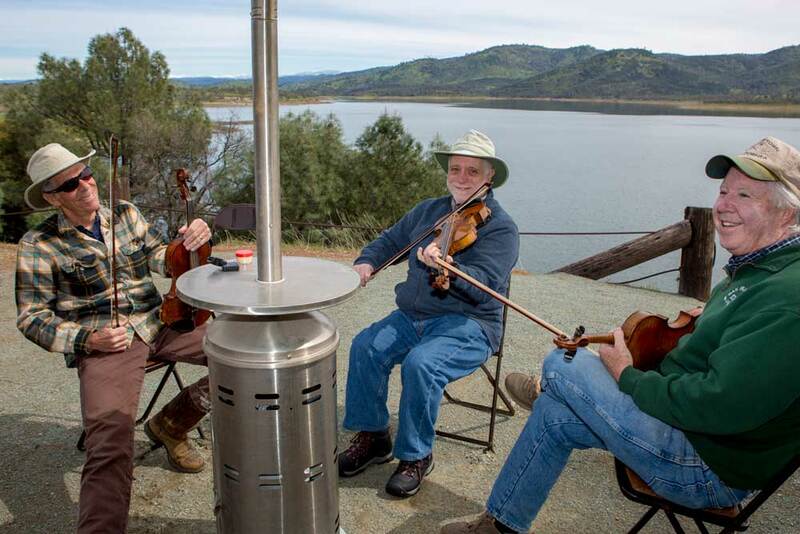 Calaveras County is rich with creativity. 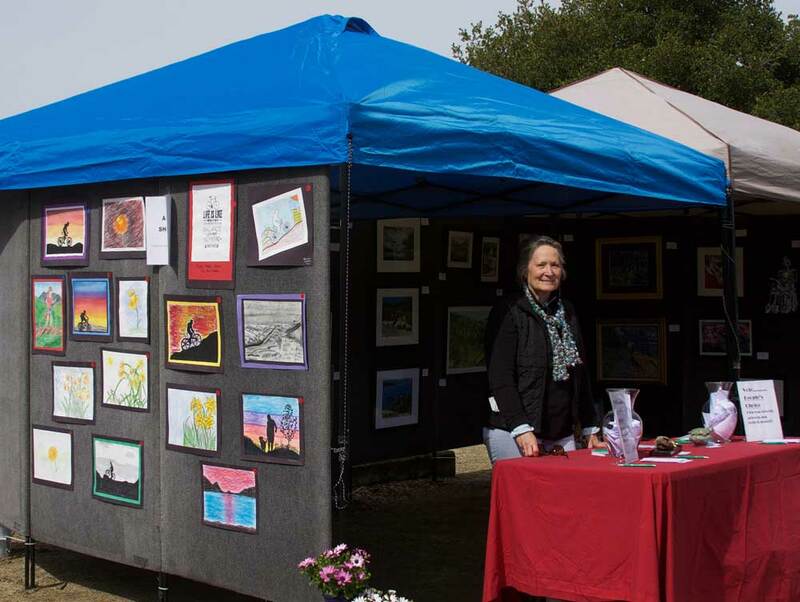 On September 22 and 23, you can experience that creativity up close and personal on the free, self-guided Artists Studio Tour presented by the Calaveras County Arts Council. Free guides are available throughout the county and at the Arts Council in San Andreas; a free map is available for download at calaverasarts.org. There’s a lot to see. Thirty artists in nineteen locations will exhibit their artwork, opening normally private studios and homes to the public. You can meet the artists, learn about their artwork, and discover treasures that you’ll want to take home. And this year, some of the artists are participating in an abandoned art project; during the week before the tour, keep your eyes peeled for artwork left in public places as a free gift to the finders. ​Every corner of the county will be represented. Starting in the Valley Springs area, you’ll find three artists conveniently located off Baldwin Street. Marlene Chapple fills her studio with oil paintings, hammered copper jewelry, ice-dyed scarves, and amazing encaustic work. From there, head over to Sue Carracedo’s studio to be charmed by her colorful watercolors and acrylics. Nearby, Brad Stone is a new addition to Artists Studio Tour, creating impressionistic landscapes and scenes of classic cars and horses in acrylic paint. ​A few blocks away on Clark Street, oil painter Sue Smith opens her home and studio to show her strongly designed work, featuring landscapes, animals, and portraits. It’s a bit of an adventure to Lower Dorray Road in Glencoe, but it’s worth making the beautiful drive to see the four artists on that street. Brenda Montelongo’s jewelry, made from glass beads, silver forms, and stamped metal would be tempting enough, but alongside Sonya Ziegler’s gorgeous paintings, photographs and decorated gourds, Andy Trinkle’s fancy woodworking and Janet Trinkle’s pressed flower pictures, it’s hard to resist. Above Mountain Ranch, watch Steven Hall make fine pottery from porcelain in his studio as he demonstrates wheel techniques and glazing. And just a short hop away, Black Eagle and MB Black Eagle open their amazing hand-crafted hill top home and studio filled with turquoise jewelry, leather bags, masks, reclaimed artist furniture, and cultural craft work. They’re new on the tour this year; don’t miss this opportunity to meet them. In Sheep Ranch, Shay Baker is back again with her fanciful paintings and drawings in acrylic, pastel, and watercolor. From there, it’s a popular but twisty drive to Michael Gustavson’s ceramic studio near Murphys on Fullen Drive, where his giant sculptures punctuate incredible views of the mountains. In Dorrington, Ann Nancy Macomber says that people say they like to start their tours at her studio, where they can see her award-winning acrylic and watercolor paintings. From there, it’s an easy drive down Highway 4 to Arnold, where Ruth Morrow, a venerable, well-known and well-loved artist holds court in her studio that’s chockablock with paintings and found-object assemblage. This year Heidi Gaissert joins the tour, displaying hand-built and wheel-thrown ceramics at her studio on Meadow View Road. Just outside of Murphys you’ll find Susan King and Aaron Quinn on Coyote Drive. Susan’s studio will be full of her luminous watercolors and collage, and Aaron, new to the tour this year, will be showing his complex and colorful ink and watercolor drawings. The elegance of letterpress printing is unmatched in our modern world, and Ryan Anderson aims to bring it back to Murphys in his print shop and studio off French Gulch Road. Come learn about this vintage art form and take home posters and cards that will inspire. A special preview reception with light refreshments will be at the Arts Council Gallery on Main Street in San Andreas on September 15, 3 to 5 p.m.
At Michel Olson’s studio just off Appaloosa Lane between Angels Camp and Copperopolis, there’s more to see than art, although Sharon Strong’s otherworldly masks and sculptures will anchor the site in artwork. But Olson, a skilled blacksmith who will be demonstrating his craft, has created gardens of standing stones and outdoor assemblage, plus a collection of gypsy wagons. Vicki Burnham Wilson’s kinetic and motorized art vehicles will give the site, and the tour, plenty of zoom. ​There will be a special preview reception for Artists Studio Tour at the Gallery store at 22 N. Main Street in San Andreas on September 15, from 3 to 5 p.m. Artworks by the artists on the Artists Studio Tour will be on exhibit and there will be a raffle of small artworks to benefit the Arts Council. light refreshments will be served; everyone is invited. 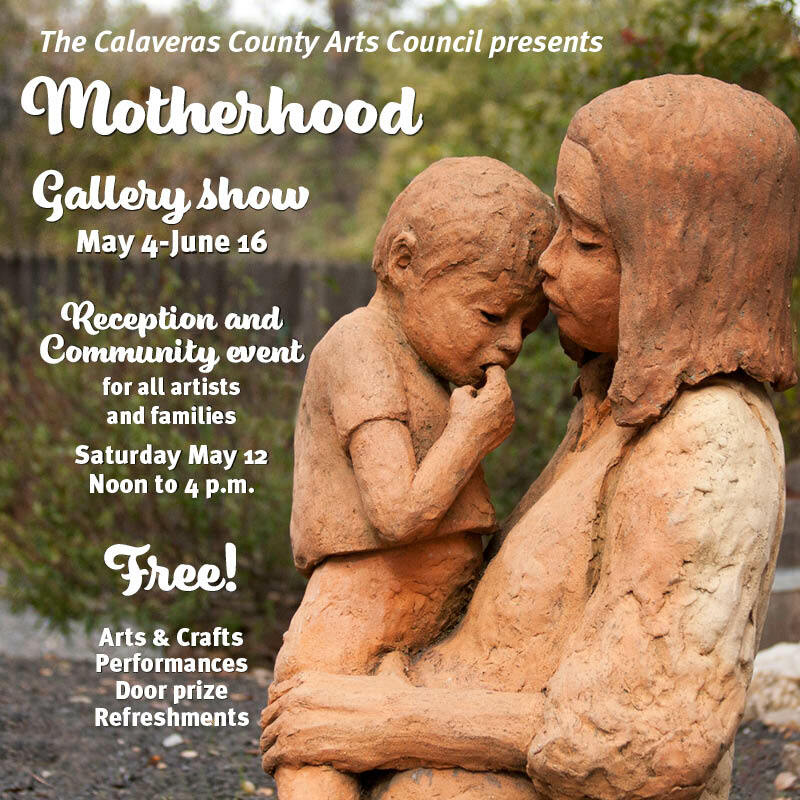 The Calaveras County Arts Council intends to wake up a sleepy Saturday afternoon—Saturday May 12, to be specific—with its first ever family community event at the Gallery Store in San Andreas. The Council is planning a free art-filled afternoon, with art tables where families can paint, weave, make a bubble wand, puppets, or a Mother’s Day card. The sidewalk behind the gallery will be the canvas for a giant chalk mural celebrating family and created by the community. A storyteller will be on hand, as well as musicians from the Murphys School of Music to keep things light-hearted. The show will feature artwork about motherhood by local artists, as well as poems and prose. If you wish to read your work, sing a song, or tell a story about motherhood, contact the Arts Council at 209/754-1774 for more information. The gallery show will extend from May 4 to June 16. Every child deserves the sweetness of arts in their education. Arts Education in Calaveras County needs your help! ​The Calaveras County Arts is committed to helping our local schools provide high quality arts instruction. We believe that children thrive when they have contact with the arts, and that the arts are a necessary part of a child’s education and life. 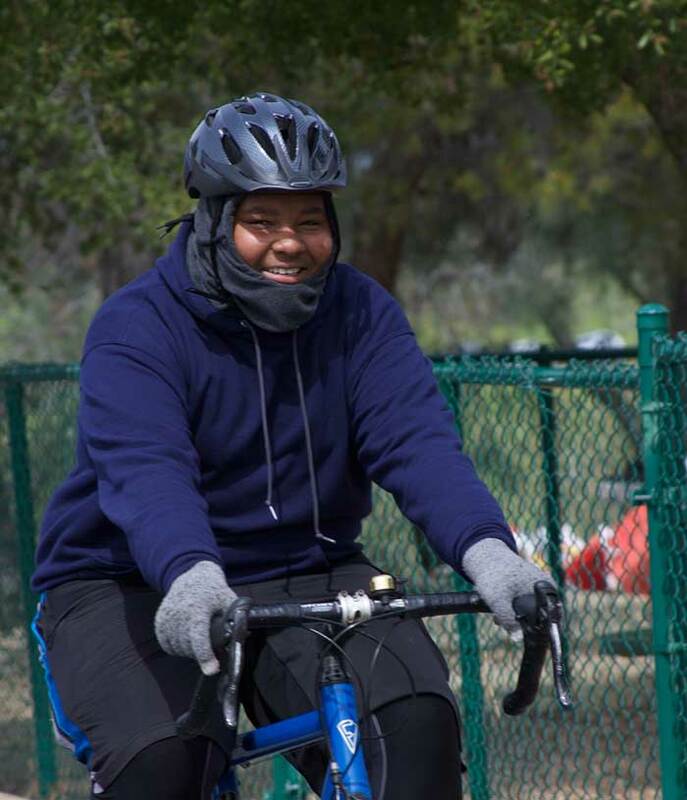 Your donations and events like Ride & Bike4Art raise funds that help kids succeed in and enjoy life. Your donations help fund a visit to San Andreas Elementary School by B Street Theater, a professional company whose mission includes outreach in education. This year they will bring the 32nd Fantasy Festival of New Plays, a touring group that celebrates the work of student playwrights. The plays, written by kids between 3rd grade to 8th grade, range in topics and include a battle between chefs, time travel, and a mystery between and old rat and a cat. The shows are entertaining for the kids, to be sure, but they’re about more than just a good show. B Street Theater brings study guides for the teachers that prompt discussions about writing, telling stories, and the themes of the plays, and offer suggestions for kids to write their own stories. For the last two years, the Arts Council has supported programs like the Jenny Lind Fine Arts Day. Every year for last 18 years, Jenny Lind Elementary School has devoted a day to the arts. Kids choose what classes they want to be in and then spend the whole day making art. Teacher and volunteers and professional artists work in classrooms giving art lessons for the kids. Past lessons have included spin art, butterflies out of coffee filters, and photography. The kids have had drama, music, and an assembly where they got to watch dancers from the Top Hat School of Dance from Burson. Your gifts will help us provide art supplies to Calaveras High School Floral design class so that students can learn watercolor in order to create artwork based on their floral designs. 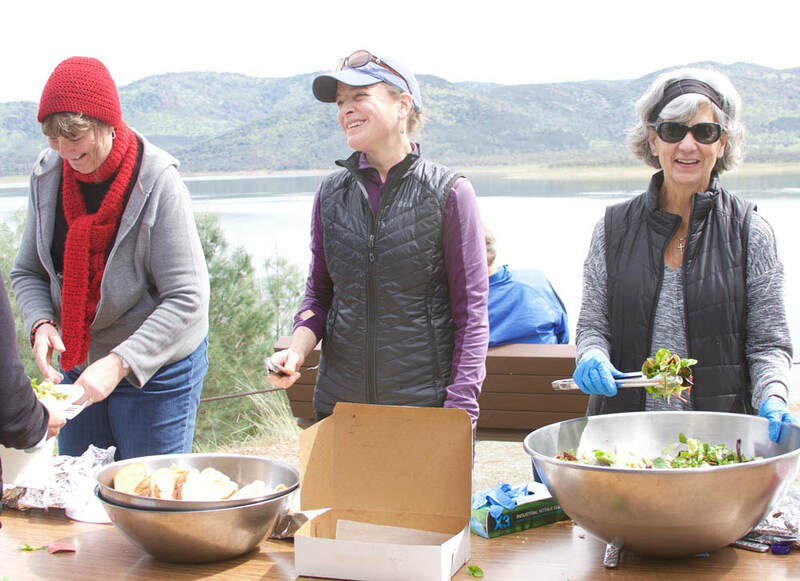 You’ll also be helping us sponsor two teachers—Anne Cook and Sue King—as they teach arch classes in the spring at Toyon Middle School. 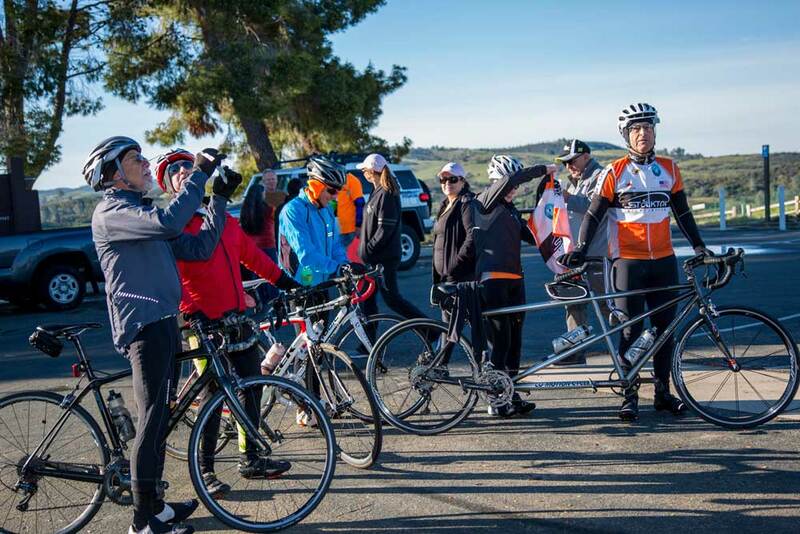 A thank you letter from Event Chairperson Rob Williams for Ride & Walk4Art, the event that brought cyclists and walkers to Calaveras County to have fun and raise money for Arts in Education in our local public schools. 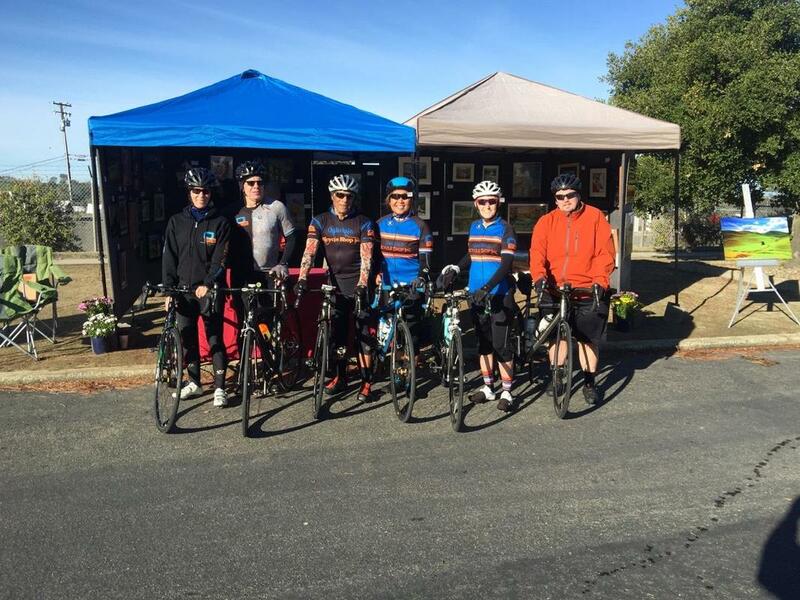 Thank you for attending the Calaveras County Arts Council Third Annual Ride & Walk4Art. 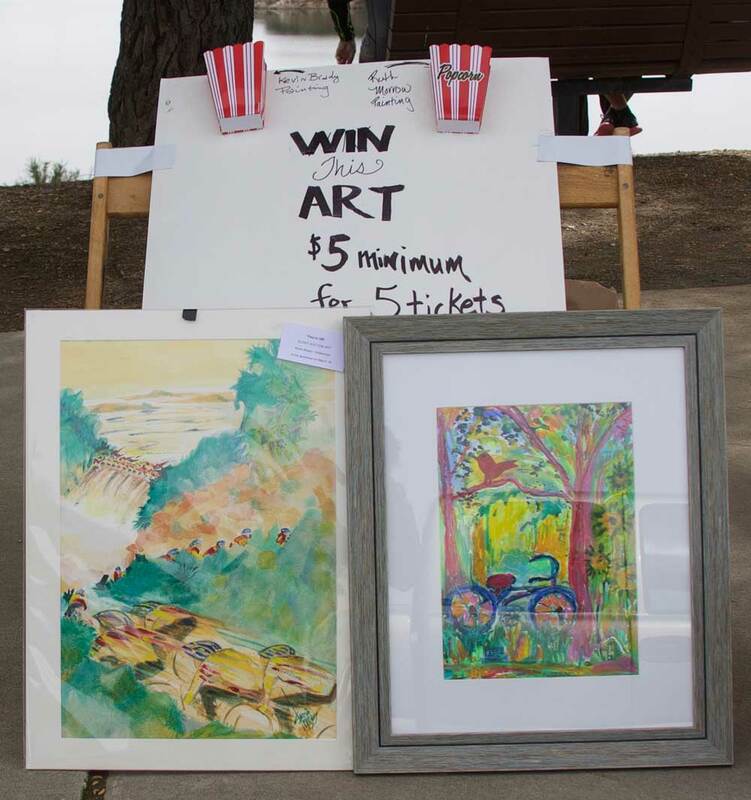 Ride & Walk4Art has been four years in the making, ever since the Calaveras County Arts Council Board of Directors imagined an outdoor fundraiser for their Art in Education program. 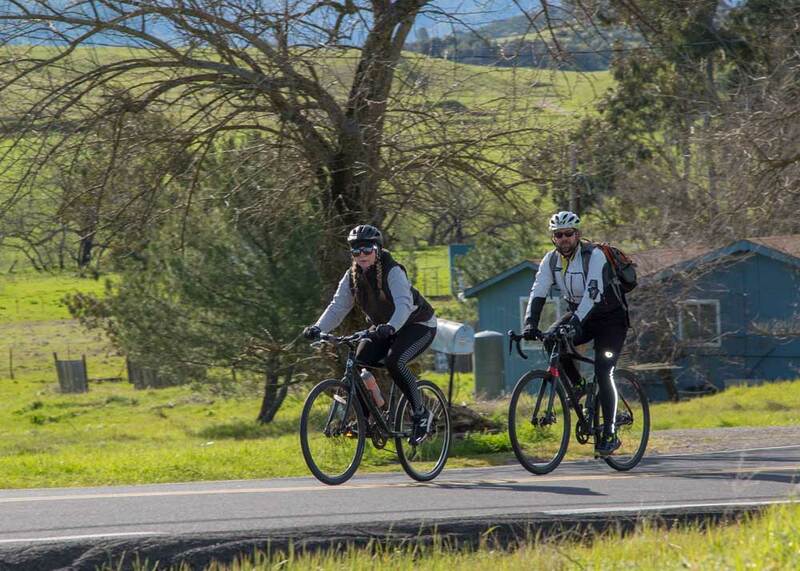 The response has been incredible: This year, 240 cyclists and walkers from all over Northern California spent a sunny spring day enjoying West Calaveras County. We thank you for your participation and generosity; you made this event great. 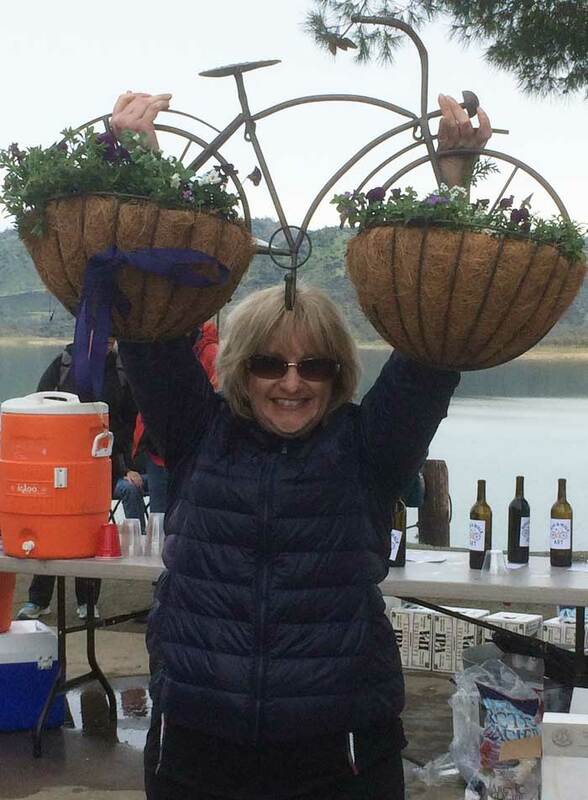 You helped raise over $6,500 to support the arts in Calaveras County public schools. 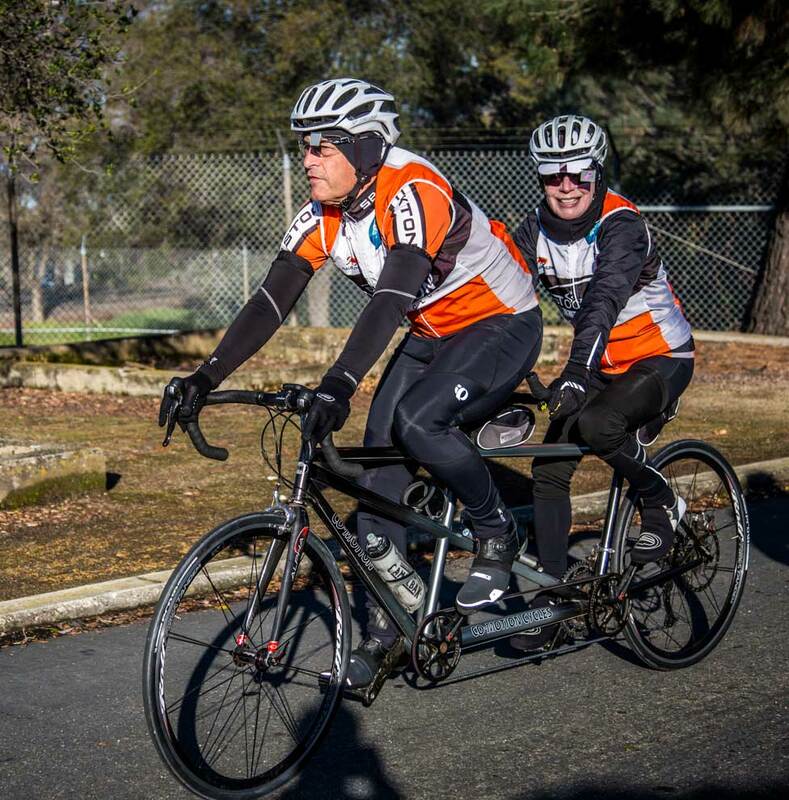 We also thank our 4 presenting sponsors—Cal-Waste Recovery Systems, Mar-Val Valley Springs, Diane and Richard Freggiaro, and the Stockton Bike Club. Their support made this event possible. 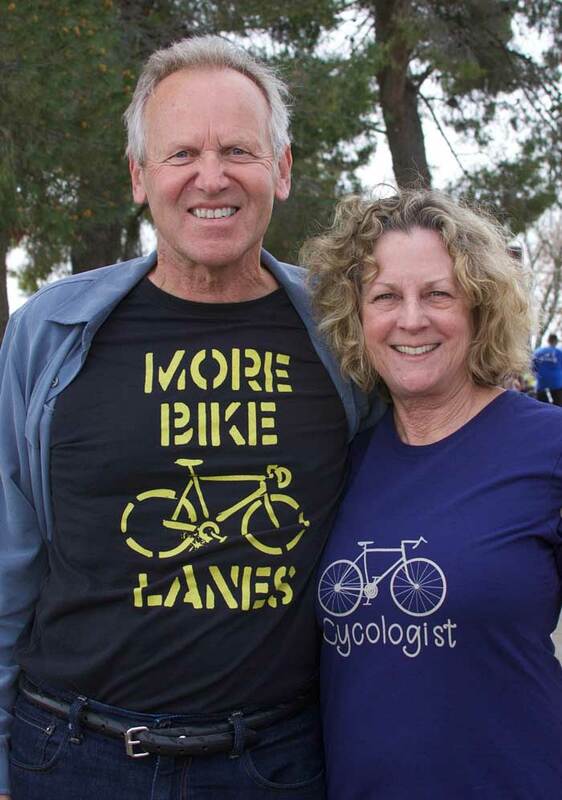 Thanks to our event photographer Susan Conner, we have pictures of you cycling and walking, enjoying Irish music, having lunch overlooking Hogan Lake, shopping for art, laughing, and celebrating. You can see those photos here. It was a great event, with only a few hiccups. A dozen cyclists turned right at Stoney Creek and rode uphill towards Jackson (Don’t worry! We found them). A young Stockton cyclist fell during a fast turn. I misplaced a safety vest and stop sign; forgot to bring the official registration list; and left my wife’s car keys at home so she couldn’t join me at opening of our event...but, all in all, it was a picture perfect Ride & Walk4Art. Someone asked me if this event is worth all the effort. It is. I think so. I care about providing art support to our local schools. 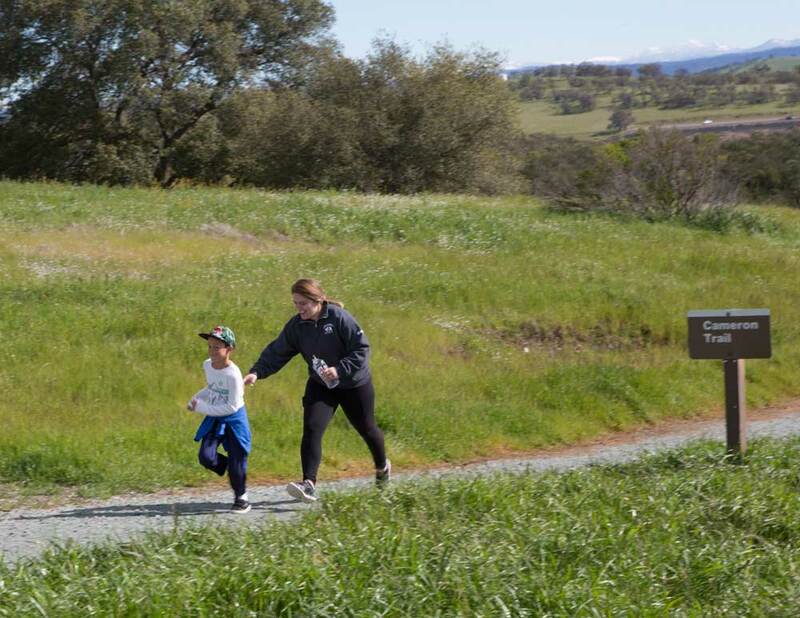 In the last year, the CCAC has helped fund arts programs in eight Calaveras County Schools; Ride & Walk4Art helps bridge the funding gap for arts in our schools. 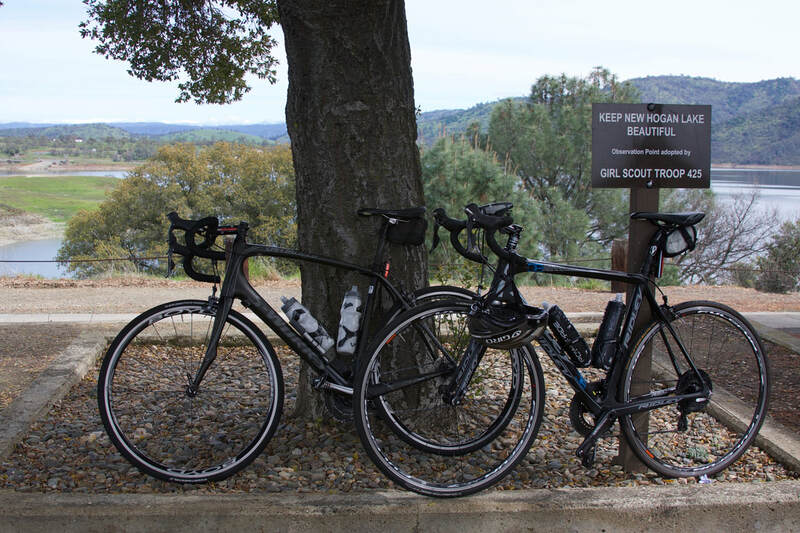 I also ride bikes in the Motherlode and hike local trails in West Calaveras County. I feel fortunate that you wanted to spend the day supporting Arts in Education at Ride & Walk4Art 2018. I had the best day ever! We are already planning Ride & Walk4Art 2019. Since it will happen on St. Patrick’s Day, we’re adding corned beef to the menu. We’re creating a Leprechaun Treasure Hunt for bike and walking teams. We also plan to add a third longer bicycle route; in fact, it’s the very Stoney Creek jog that took some cyclists towards Jackson. 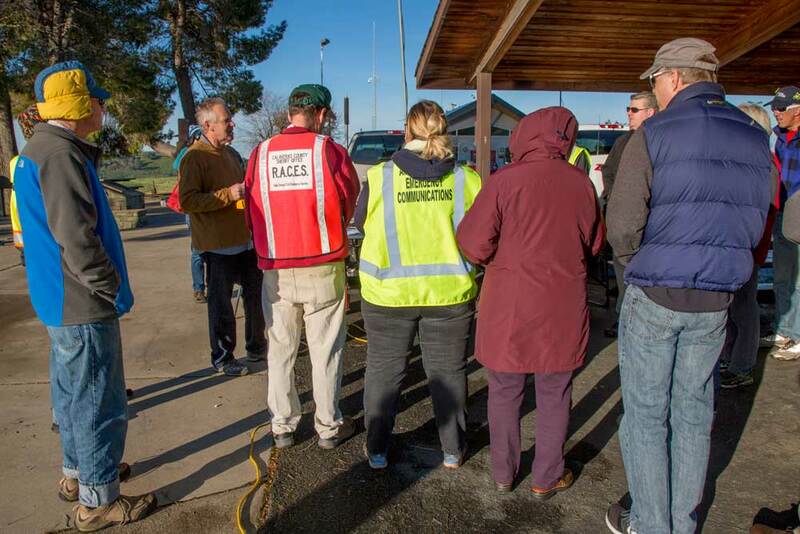 We do our best to make every participant feel welcome, safe on road or walk, entertained, well-fed, and part of a community. Thank you for supporting Arts Education in Calaveras County public school and riding and walking in with us. We’ll see you next year! Ride & Walk4 Art Biking and Walking fun! 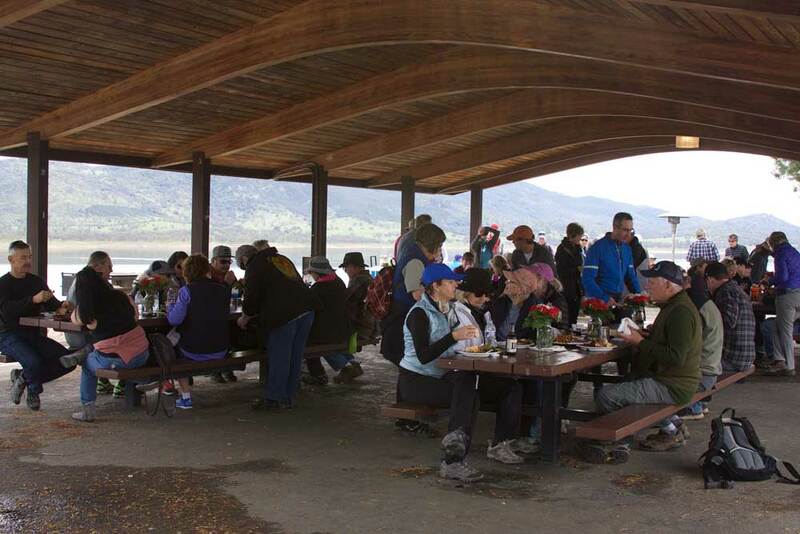 On March 19, 2018, the Calaveras County Arts Council presented our Third Annual Ride & Walk4Art event at New Hogan Lake. 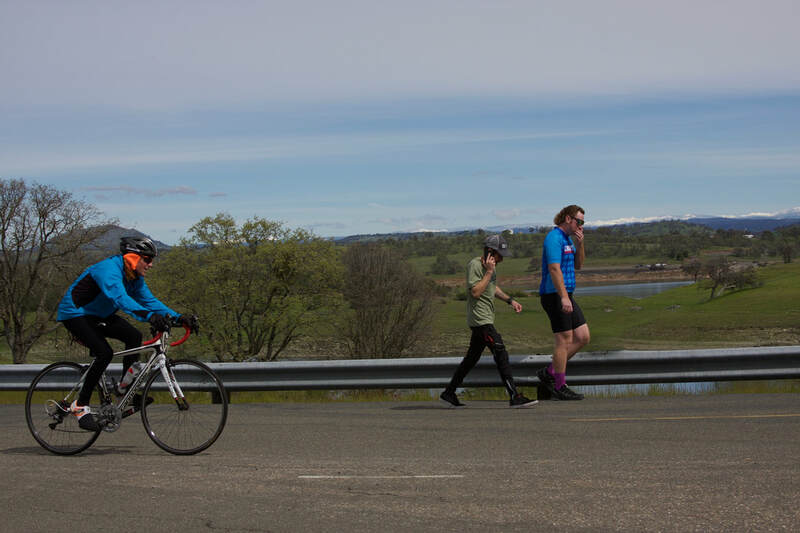 250 cyclists and walkers took part, helping us raise over $6,500 dollars for our Arts in Education program to support arts funding in Calaveras County public schools. It was great fun and we look forward to next year! 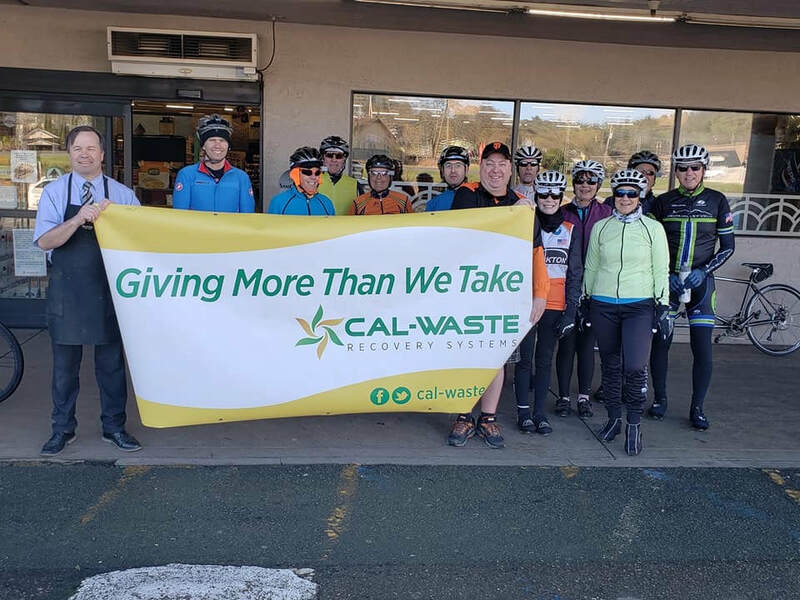 Our sponsors (from left): Mitch Rerutko, general manager, and Rick Williams, assistant manager of Mar-Val foodstore in Valley Springs, Stockton Bike Club, Cal-Waste Recovery Systems. We were so happy that the day was sunny and warm! The morning was gorgeous, and our volunteers eager to help make this a fantastic event. Oakdale Bike Shop with John Hernandez Jr. (third from left) ready to go riding in front of the art show tents. Cyclists wer lined up and ready to go! We even had a tandem bike. (I could not help singing "Daisy, Daisy, give me your answer true..."
Oakdale Bike Shop rolls through Valley Springs. There were some runners on the the walking trail! Dereen Deschryver, chairperson of the art show, did a fabulous job of setting up tents and panels and displaying art. We sold 5 pieces at the show; you can see the whole show at the gallery in San Andreas through April. The Tri Dams Lion Club got all smokey making delicious chicken in a barrel for lunch. Thanks! Musicians entertained every one with Irish jigs and reels and a few American Old Time tunes. (From left: Tom Frederick, Art Friedman, Robert Kerwin). Maxwell Louis from Stockton said he had a great ride. It was his first one, and he finished! Opportunity drawing prize donated by Dereen Deschryver. Volunteers Donna Guadagni and Libby Kirk relax at the end of the day. Artwork by Kevin Brady (left) and Ruth Morrow (right) was up for an opportunity drawing. The competition was fierce for this donated artwork! Thanks to Kevin and Ruth for their generosity! 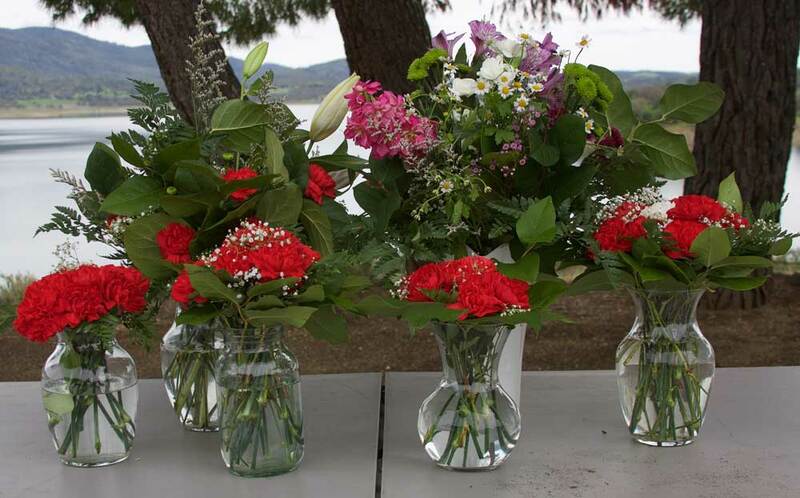 Floral arrangements were donated by the floral arts class at Calaveras High School taught by Kevin Hesser. Lunch was a success, with plenty of food for everyone, good times, good tunes, good art, and good company. Rob Williams conceived, planned, co-ordinated and chaired Ride& Walk4Art. We thank you Rob, and Cynthia Przybyla, our board president, for your tireless work, amazing organization, and for being a dream to collaborate with for this event. March 11, 3 p.m to 5 p.m.
​3:00 p.m. to 5:00 p.m.
We rely on the generosity of those who can contribute to help keep our Ovations series available to the community. Please help if you are able. Thank you for your support. I’ve got to come clean. 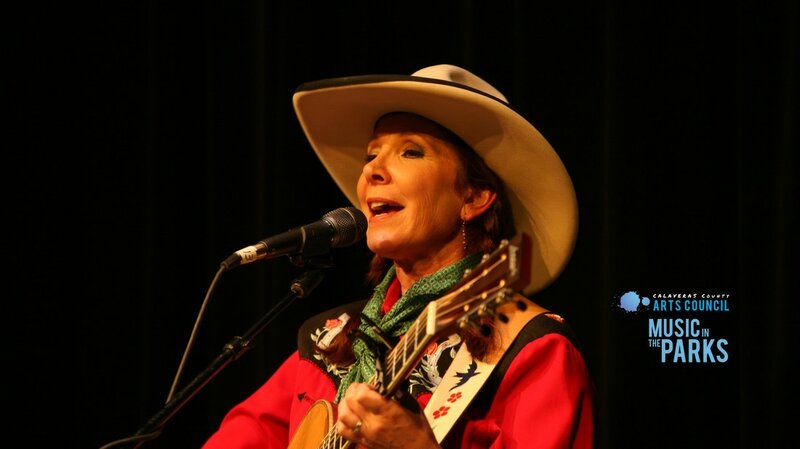 I once had the amazing opportunity at the Cowboy Poetry Festival in Monterey to play music on stage with Juni Fisher. It was the high point of my musical “career” to play Irish dance music in counterpoint to the tales that Juni told—in story and song—about the Irish diaspora in the American West. She was the most professional, capable, and organized musician I’ve ever met. She held the audience riveted. ​In truth, Juni is an inveterate story teller. She spins yarns about the heartbeat of the American west, what she calls the Western Vista. Sodbusters, cowboys and cowgirls, sideshow attractions, horses, pigs, chickens, and cows all come to life with Juni’s recounting of heartbreak, hope, love, cunning, and foolishiness. She sharpens the excitement that helped build our shared Western mythology. "I don't just come and sing songs," she said. "It's a combination of stories, songs, and stand-up comedy. I like to bring laughter into it even if it's serious." Don’t think that these are some kinds of novelty songs, because they’re not. Juni sings stories told in spare lines of poetry set to lyrical tunes that are bewitching. If you find yourself tearing up at the plight of a little red horse, or sighing romantically over two lovers who are, well, unusual, you can be forgiven for falling under her spell. Juni has been described as having “luminous intensity [that] ignites her writing and her performances. At the heart of her unique and complex artistry is her ability to bring alive what become unforgettable characters and images, stunning stories that often carry a deep and compassionate reflection of the human spirit." Plus, she’s a solid entertainer; her performance topknotch. She punctuates her songs with clean, clear, crisp guitar playing, and her singing never strays from pitch, tone, or the sheer joy of performing the stories she loves to tell. So it’s without a shred of reluctance that I advise you to go to the Bret Harte Theater and let Juni charm you into falling in love with the Western Vista. It will be a magical show and you will not want to miss it. This time I’m looking forward to being in the audience. At the gallery we sometimes receive artwork that has not been wired to hang. It makes us really sad, because we can't display unwired work effectively, despite the work being beautiful. But it's quite simple to prepare your flat image for display: simple D-ring picture hangars and wire will do the job.And there are benefits to using D-ring hangars. D-rings will ensure the security of your painting; a properly sized D-ring won't pull out of the frame. A properly wire-hung painting is easier to level on the wall. A properly wire-hung image looks neat and professional. D-rings are available in most hardware stores, and are easy to install on your frame. Remember that large heavy frames will need larger, heavier D-rings with more holes in them to evenly distribute the weight. Many galleries and shows require artwork to be hung with d-rings and wire; they will not accept work that is not hung this way, so we encourage you to get in the habit of presenting your work in a professional manner. Katherine Tyrrell has a great post on how to hang a picture. The video below is a great tutorial. For some artists, entering competitions can be thrilling, a chance to cast their art into the world with other artists and see how it stands. You just never know how it will all turn out. But we all know that competition in the art world is fierce. So what steps can you take to best prepare your work for the challenge? Yes, I know. We're artists. We live outside the rules. But when entering a competition, realize that you can be bumped for ignoring instructions. Break rules in your artwork, not on your entry form. Channel your inner Rory Gilmore and pretend like this is a homework assignment and you're aiming for an A+. Print out the entry form, read it a couple times, then highlight the important instructions. Use the form as a checklist, and check and recheck to make sure you haven't missed anything. Hit all the deadlines. Mark those on your calendar and start submitting a day early, because computers! There's always going to be a glitch or a gremlin in the process. Leave time to work those out. Playing by the competition rules are part of the sport. Enjoy them. You will be asked for an image of your work, probably an electronic image. Don't throw shade on your own work by submitting sub-par pictures. If you don't have the funds for a professional art photographer (and how many of us do? ), here are a few tips for taking your own images. Give your art a fighting chance with accurate lighting and color, and razor sharp focus. Photograph your artwork BEFORE you frame it, especially if it is going to be framed under glass; glare on glass will detract or obscure your artwork. Only your artwork should be in the photo. Not the frame, unless the frame is part of the artwork. No people. No furniture. No MacDonalds hamburger wrappers. Just the artwork. Delete watermarks. Don't submit watermarked images to competitions. The judge need to see the whole image. Say what now? You got accepted into the show! Yay!!! The next step is to make sure that your artwork is framed beautifully and wired properly. Professional framing, while expensive, will ensure that your work is show-ready. If you must frame your own artwork, here are some tips to make every piece hang straight and true. Use appropriate frames. Choose frames meant to hang on the wall, not be propped up on a dresser. That little propping thingy on the back of the frame holds your image off the wall awkwardly and makes it look unprofessional. String the wire short of the top of the painting. You don't want the hanging nail to be visible at the top of the painting, so keep the wire a couple inches below the top of the painting. After all that work, you didn't get accepted. Remember that this isn't a comment on the quality or desirability of your artwork; it just means you didn't get into this particular show. Don't be discouraged. Keep applying to shows, keep upping your application game, and most of all KEEP CREATING!